It has been replaced by the HDA-200!!!! Winegard's new HDA series of Distribution Amplifiers was designed to meet the market demand for a heavy duty, quality built, cost effective solution for the amplification and distribution of analog/digital broadcast signals from Off-Air and cable TV stations. The HDA-100 is housed in an industrial grade, weather resistant enclosure. Each unit has an RF input, amplifier also provides a 5 - 42 MHz 2-way bi-pass. 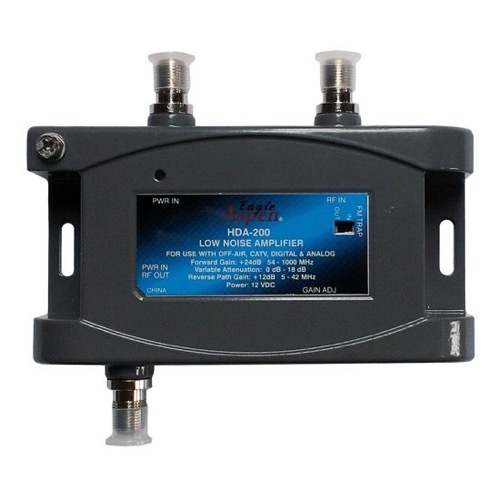 The Winegard HDA-100 is a single RF input, 15 dB gain, single RF output, with a 5 - 42 MHz 2-way bi-pass at -2 dB loss.